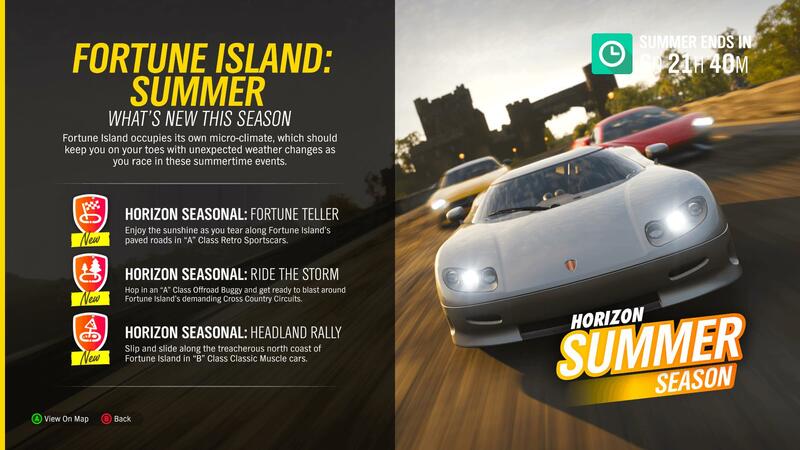 Series 5 has officially arrived into Forza Horizon 4 with the return of the Summer season! New challenges, events and more await players in beautiful, historic Britain – including the arrival of the latest flagship supercar to debut exclusively in the Forza franchise, the 2019 Porsche Carrera S. As part of Microsoft’s ongoing six-year, multi-project partnership with the German automaker, the most technically-advanced and high-powered 992 is available today to race and power-slide around the British countryside, exclusively to Forza Horizon 4 Car Pass holders. With the arrival of Summer, the sun is shining bright with clear blue skies as far as the eye can see. Trees and shrubbery have matured as green fields cover the British landscape. It’s Britain at its finest, and the Summer season is here for both the mainland and Fortune Island – so take advantage of the good weather whilst you can as it’ll only be here for a week! As a reminder, the seasonal change in Forza Horizon 4 occurs every Thursday at 2:30pm GMT. That’s 9:30am EST and 6:30am PST. Below, we’ll have a look at everything that’s new to discover this week in both beautiful, historic Britain and the Fortune Island expansion. 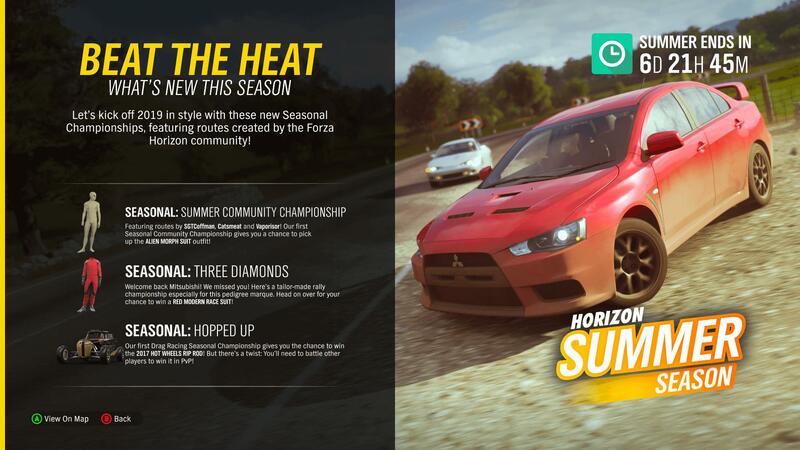 From new types of Seasonal Championships to unmissable new cars, this is your ultimate guide to everything new in Horizon Life this Summer! This week’s Seasonal Championships are quite different to the norm. 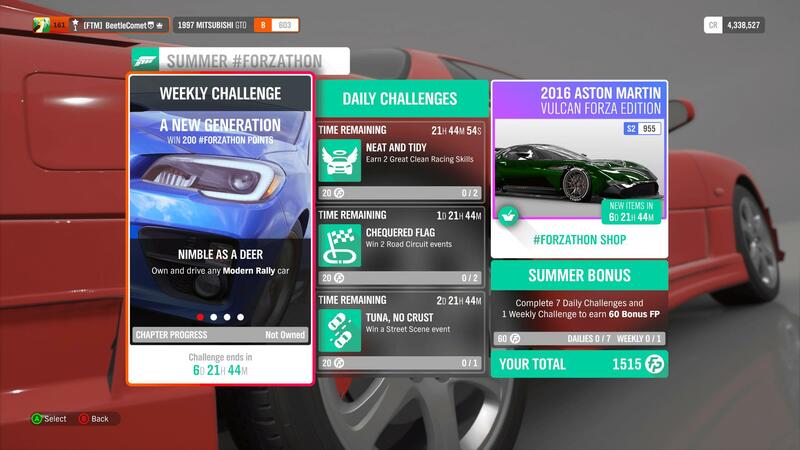 Instead of the usual slate of circuit and sprint races, developer Playground Games has begun spotlighting community-created events made using the Route Creator in their own dedicated Seasonal Championship – with different courses being showcased each week. There’s also a brand-new Drag Racing Seasonal Championship too, which is all about that horsepower, launch control and straight-line speed across the finish line! First up is the Summer Community Championship, featuring routes handpicked from the community with the Alien Morph Suit outfit available to unlock. Up next with tailor-made rally events is the Three Diamonds Seasonal Championship, featuring the Red Modern Race Suit. But if that wasn’t enough to get you excited, then winning the first Drag Racing Seasonal Championship at the Horizon Festival in PvP will earn you the 2017 Hot Wheels Rip Rod! There’s also the Trial event, which tasks you to team up with 5 other drivers to take on a team of Drivatars set to Unbeatable difficulty – with this week’s prize being the Modern Race Helmet Black variant! Furthermore, this week’s Seasonal PR Stunt features the Royal Botanic Gardens Speed Trap in Edinburgh, which tasks players to set a speed of at least 175mph. Beating the challenges offered by Seasonal PR Stunts will grant you a bonus Wheelspin or Super Wheelspin. Meanwhile, Fortune Island has three of its own Seasonal Championships for players to check out this week, including series for asphalt, dirt and cross-country racing. The ‘Fortune Teller’ Seasonal Championship will see you racing A Class Retro Sportscars across Fortune Island’s paved roads under the sunshine. ‘Ride the Storm’ will see you in an A Class Offroad Buggy blasting around the most demanding of Cross-Country circuits on Fortune Island. Finally, the ‘Headland Rally’ will see you head onto dirt trails across the treacherous north coast of the island in B Class Classic Muscle cars. There’s also two Seasonal PR Stunts available this week on Fortune Island. The Festival’s Apex Speed Zone tasks you blitz through it at 155mph, whilst the Fenholm Ruin’s Leap Danger Sign requires a jump of at last 918.6-feet. Completing Fortune Island Seasonal Championships and PR Stunts will see you earn additional Wheelspins that can unlock a variety of unique items, including bonus credits, rare cars, vehicle horns and clothing. Fortune Island will continue to receive an assortment of dedicated Seasonal Championships and PR Stunts every Thursday to accompany the mainland season change and these will always remain exclusive to owners of the expansion. This week’s Forzathon event sees players behind-the-wheel of their favourite Modern Rally car, which includes the collection of Mitsubishi cars added to Forza Horizon 4 this week. Whichever ride you end up choosing, you’ll need to push it up to 185mph before earning a total of 15 stars from Danger Signs using it and achieving a podium finish in ‘The Gauntlet’ goliath-style dirt event. 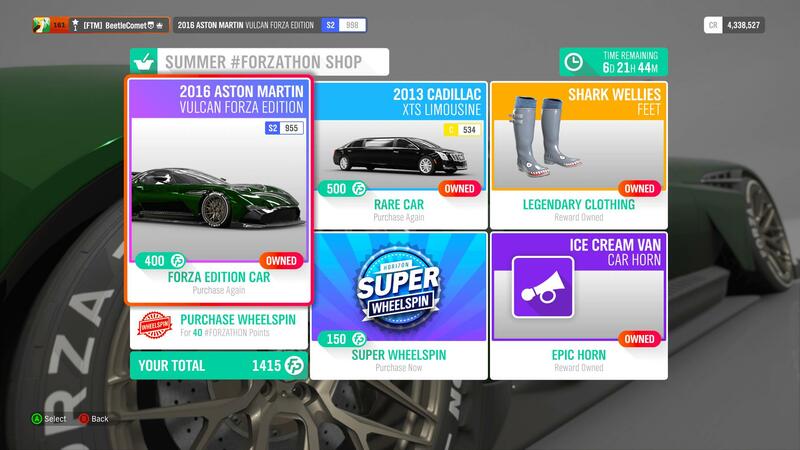 Every week, the Forzathon Shop replenishes its stock of exclusive cars and clothing items, and this week is no different. In terms of cars, we have the 2016 Aston Martin Vulcan Forza Edition available to unlock for 400 Forzathon Points and the 2013 Cadillac XTS Limousine priced at a costly 500 Forzathon Points. Meanwhile, there’s also Shark Wellies and the Ice Cream Van Horn should you desire to personalize your character and ride that bit more. Forza Horizon 4 expands its offering of automobiles with the latest batch of rides available for Car Pass holders. For those unaware, the Forza Horizon 4 Car Pass introduces two new cars every week for players to drive across beautiful, historic Britain – an initiative that lasts for a period of 21 weeks to deliver a total of 42 brand-new cars into the game. This week’s Car Pass additions kick off Series 5 of Forza Horizon 4 content and include a pair of legendary automobiles from one of the most iconic and respected manufacturers in the automotive industry – Porsche. 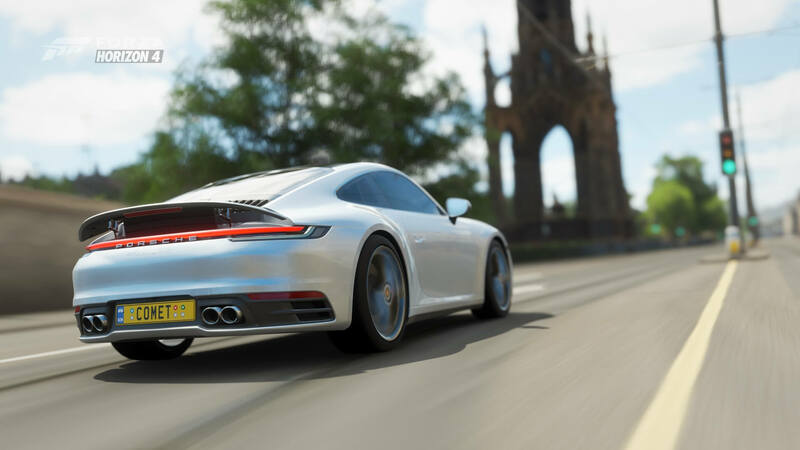 The newly-added rides from the acclaimed German automaker include the 2019 Porsche Carrera S and the 1993 Porsche 968 Turbo S – both of which are ready to be collected, customized and raced alongside the British backdrop in Forza Horizon 4. Remember, these rides are available to add to your in-game garage today at no additional cost if you own the Forza Horizon 4 Car Pass, included in both the Deluxe Edition and Ultimate Edition of the game. The Forza Horizon 4 Car Pass can also be acquired separately and is discounted for Xbox Game Pass subscribers. Experience the Summer season this week in both Forza Horizon 4’s Britain and Fortune Island until Thursday, January 24th. This is when another seasonal change will occur in Forza Horizon 4 as we welcome the arrival of Autumn and its slate of fresh events, challenges and cars. In the meantime, if you didn’t unlock the Summer Barn Find already, then be sure to find it over the next seven days. 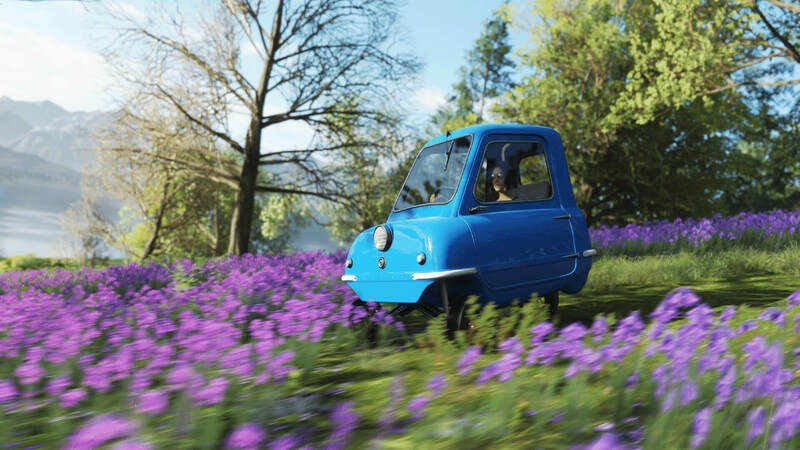 This one is a beloved fan-favourite in the 1962 Peel P50 and it can be found in the middle of a forest below the Uffington White Horse towards the town of Ashbrook. You can also discover the new experiences featured in the Series 5 Update for Forza Horizon 4, which includes the return of Mitsubishi and a new Horizon Story in Isha’s Taxis. 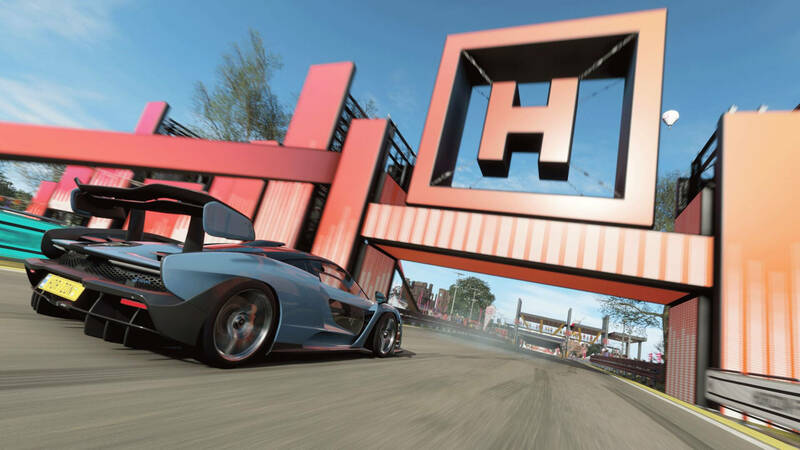 There’s also the arrival of the solo-inspired ‘Free-for-All Adventure’ mode, as well as a host of smaller improvements and tweaks that result in an all-around better Forza Horizon 4 experience. Be sure to read our full breakdown of everything featured in the Series 5 Update for all the details you need to know.